Ask This Boss: Tonya Garrett, Managing Director at Jones Knowles Richie — Where Are The Boss Ladies? Last week, we asked you on Instagram if you had specific questions for Tonya Garrett that can help you in your leadership. Here are answers from a true boss. 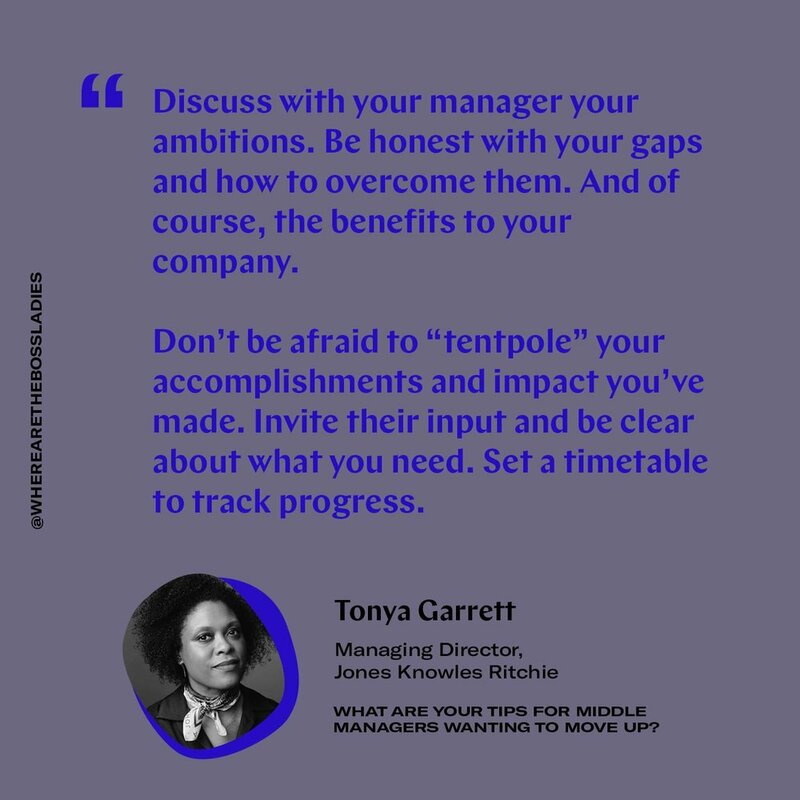 💼 Tonya Garrett is a Managing Director at Jones Knowles Ritchie, a global brand design agency with offices in NY, London, Singapore and Shanghai. 💁🏾‍♀️ Her leadership style: Calm, inclusive, direct and solution-focused. 🍭 Her passion: The intersection of talent, operations and capabilities. and how to connect to build high performing teams that make impact. 🌎 Tonya Midwest-bred New Yorker who started her career in Management Consulting and has spent the last 18 years agency side across Digital, Advertising and Design holding leadership roles in Client Services, Operations and Executive Leadership. What are your tips for middle managers wanting to move up? Tonya Garrett: Making moves—the ongoing quest. You don’t have to wait to get the role or title to start performing at that level....do it and ensure visibility while you are doing it. Make a plan. What is the role you want? What is required of that role? What are you currently doing that fulfills this role? What are the gaps? Be honest with yourself. Discuss with your manager your ambitions. Be honest with your gaps and how to overcome them. And of course, the benefits to your company. Don’t be afraid to “tentpole” your accomplishments and impact you’ve made. Invite their input and be clear about what you need. Set a timetable to track progress. Timetable and opportunity are key. If you are delivering against objectives, and you don’t see the path for success, don’t be afraid to broaden your view of what’s out there. How do you keep teams inspired in times of adversity? Teams can see through the BS. It’s okay to share a bit about what’s going on and the impact to the business or the team. Truly empathize with how it’s impacting the team. Everyone doesn’t experience adversity in the same way. There is no right or wrong. Well, there is wrong—anything destructive or counter-productive. What are we doing to make impact? How do we define progress—long and short term? How will we monitor? What’s everyone’s role including leadership? Deliver a tangible action plan with confidence. 4. Reinforce that success is about the team. When times are tough, everyone wants to feel part of something, vs. the win just for the individual. If individuals just want to be the naysayers, then they probably aren’t right for the team and aren’t going to be inspired by anything. What are some indicators that a manager is not leading? Tonya Garrett: Hi there. To start, it is important that the manager and leadership have a shared understanding of what leading means and how it’s measured: in clear objectives, feedback from peers, team, but also external partners and clients, if appropriate. If the manager can’t mobilize their team to meet said objectives, and offers no alternative of what success looks like...they probably aren’t leading. They are just doing and possibly in the wrong role or organization. How do you maintain a strong culture during a phase of strategic growth—while creating space for new norms and needs, that may result shift in culture? Tonya Garrett: Great question as all forward thinking places are battling how to evolve but keep what’s great at the core (e.g. culture). I’m still learning! My POV is a great culture is about the people and alignment on a shared vision and expectations. Solid leadership that can share a vision and everyone's role/contribution needed to make it happen (from the day to day to next 9-12mths) is a start. Shift in culture is expected as long as the company values are not compromised and great people have a role to play in the shift. Also I believe it is okay to realize that not every great person today is right for the organization’s future (for the company and the individual). Recognize early as great people in wrong role can deteriorate culture faster than one thinks. Finally be brave and know that with change sometimes things break to get us to truly being great. Thank you for your leadership, Tonya!